A versatile analytical methodology is presented, that combines the application of two mobile laser-based analytical techniques, Raman microscopy and laser-induced breakdown spectroscopy (LIBS), for the analysis of materials in historical and archaeological objects and monuments. In the present study, the proposed methodology was employed in the context of analytical campaigns aiming to investigate paint materials used on the island of Crete during the Venetian and Ottoman periods, thirteenth to nineteenth century CE. The first series of campaigns were conducted at the Historical Museum of Crete, Heraklion, Greece, and provided for the first time compositional data concerning the pigment palette used for painting Ottoman sculpture in Crete. In the second series, campaigns were performed outdoors for studying pigments in the sculptured door frames of two small medieval churches situated at rural locations in the greater Heraklion area. Raman and LIBS analyses gather complementary compositional data, molecular and elemental respectively, which, taken jointly, enable, in most cases, identification of pigments and accessory materials in paint layers, providing also stratigraphic information. With both instruments, measurements are performed directly on the surface of the objects or monuments, with no need for any sampling or sample preparation and thus analytical studies can be conducted rapidly and routinely in the context of a museum setting, a conservation laboratory or even outdoors. A standardized procedure that facilitates data collection and interpretation, interdisciplinary cooperation and presentation of results is adopted that optimizes the overall efficiency of the analytical campaigns. Pigments represent a component of high artistic, technical or historical significance in painted works of art as well as in a large number of heritage objects and monuments. Characterisation and analysis of pigments and colorants enables archaeologists, historians and conservation scientists to identify painting techniques and follow their evolution across the centuries, to support archaeometry studies, related to provenance, dating or authenticity, to detect material degradation and possibly understand the causes and mechanisms of it, or to come up with proper methods of conservation and restoration and evaluate their effectiveness. To achieve these objectives, researchers have been increasingly employing advanced analytical techniques and instrumentation, which, in many cases, are capable of providing detailed information about the composition and identity of paint materials. However, an important limitation in such investigations, derives from the fact that, often enough, heritage objects are immovable or represent an integral part of an archaeological or historical site, for instance, wall paintings, hence their transfer to analytical laboratories or facilities is not possible. This also holds in the case of some movable objects, whose value and significance place strict limitations in their moving. Collecting microsamples is often an alternative for bypassing the above limitations, but current trends, concerning protection and preservation of cultural heritage objects, impose non-sampling policies or strict controls in performing sampling for further analysis in the laboratory. Obviously the option to use mobile analytical equipment, which can be operated on site, emerges as an important prospect [1–5]. In this context, a versatile analytical methodology for paint analysis on heritage objects, has been developed, which employs (a) micro-Raman spectroscopy and (b) laser-induced breakdown spectroscopy (LIBS), based on mobile and compact portable units. These spectrochemical techniques provide complementary analytical information, molecular and elemental, and thanks to their mobility, satisfy the demands for immovable heritage investigations, enabling analytical campaigns to be conducted routinely at museums, conservation laboratories or even outdoors at historical and archaeological sites. In brief, Raman microspectroscopy is nowadays a broadly established technique for materials analysis and has been shown to be a powerful analytical tool in the context of art conservation and archaeological science, with significant results concerning pigment identification [4–7]. It offers high sensitivity and specificity enabling analysis of a wide variety of inorganic and organic materials, often directly on the object under study, non-invasively, in a short time and with very high spatial resolution. The basis for identifying different materials derives from the characteristic vibrational modes of molecules/materials and their corresponding frequencies, which are recorded in Raman spectra. These frequencies are highly specific enabling one to discriminate hardly distinguishable materials [8, 9] or even different crystal phases of the same minerals . A number of compact Raman micro-spectrometers are at present commercially available, while laboratory prototypes are also in use for specific applications. Considering field archaeological or conservation work with a Raman spectrometer, a number of factors needs to be taken into account concerning mobility, operational flexibility and robustness, analytical capabilities and cost . Laser-induced breakdown spectroscopy (LIBS) provides information about the elemental composition of materials. Briefly, focusing a pulse from a nanosecond laser onto the surface of an object under analysis generates a transient micro-plasma, which emits light upon relaxation. Recording the plasma emission on a spectrometer produces the LIBS spectrum, which features, sharp atomic emission peaks leading to the identification of the elements contained in the sample. The peak intensity or the integrated emission is related to the number density of each emitting species in the plume and this, in turn, with the concentration of specific elements in the ablated material [12–15]. LIBS analysis can be applied in situ, eliminating the need for sample removal and/or sample preparation. Considering that laser ablation is involved in a LIBS measurement, removal of a minute amount of material from the sample surface takes place with each laser pulse (mass removal on the order of a few nanograms), and so the technique is termed as micro-destructive. The trace left on the object surface is hardly visible by the naked eye. 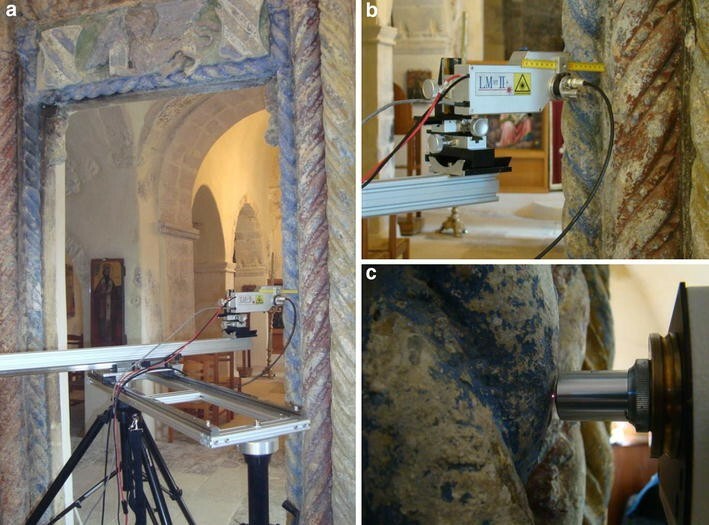 Actually, the diameter of the laser spot is in the range of 150–300 μm, with the mobile system used in this study, whereas its depth per pulse does not exceed a few micrometers, in the case of wall paintings . To this end, LIBS can provide an equivalent of depth profile analysis, taking into account that each laser pulse removes from the surface a thin layer of material and therefore the subsequent pulse always probes the paint slightly deeper, in its stratigraphy, than the previous one [16, 17]. Finally, experimental equipment needed for LIBS is both simple and versatile, favoring the development of compact portable instrumentation, which can be employed in field analysis including campaigns at museums or historical and archaeological sites [18–20]. As already stated, applied jointly, the two techniques present a cooperative analytical advantage, with elemental composition information obtained via LIBS analysis complementing the molecular information provided by Raman spectroscopy, thus leading to an integrated characterization of pigments and minerals, superior to those obtained with the individual Raman or LIBS data sets alone [21–24]. Particularly, in the context of wall painting analysis, research studies by Bruder et al. illustrate the complementarity of LIBS and Raman microscopy for the in situ analysis of fresco replicas while Westlake et al. have demonstrated the combined use of the techniques in the analysis of mural painting fragments, still performing analyses on small plaster fragments in the analytical laboratory. At this stage it is noted that hybrid LIBS-Raman systems, in which the two spectroscopic techniques utilize the same pulsed laser source, spectrometer and detector, have been proposed that perform combined measurements on heritage samples. Such hybrid instruments would be ideal for campaigns like the ones described in this paper, however, technical aspects, particularly with respect to the efficient operation of the Raman sub-unit with a pulsed laser source, need further development [27, 28]. In all, encouraging results obtained in the laboratory with the compact LIBS and Raman spectrometers, motivated further application of these systems in field analytical campaigns. The study presented herein concentrates on the combined use of Raman microscopy and LIBS on location, investigating their efficiency and complementarity when used actually in situ. Main objective of the analytical investigation is to monitor pigments used to decorate stone sculpture produced on the island of Crete during the Venetian and Ottoman times. More precisely, concerning the period of the Venetian rule, architectural types of sculpture are mostly preserved, whereas inscriptions and bas-reliefs are characteristic of the Ottoman period1 . Campaigns were performed in a museum environment (the Historical Museum of Crete), in a conservation laboratory setting (at the Ephorate of Antiquities in Heraklion), and outdoors, involving two small medieval churches at rural locations. The article presents the methodology followed during analytical campaigns with the aim to achieve quick and effective screening of historical objects, based on the type of paint materials used, and outlines a standardized procedure that encourages interaction among scientists and historians or conservators, and facilitates interpretation of data and presentation of results, thus maximizing the overall outcome of a campaign. Considering the materials historical perspective, this is the first time that such a study is carried out in Greece for a period other than antiquity. Concerning the Venetian period, the study of pigments on stone sculpture complements similar studies of pigments in wall paintings . However, the study of Ottoman sculpture is the first analytical investigation with the aim to identify pigments and specify the Ottoman palette of artworks in the Greek territory. Furthermore, it is noteworthy that this study is focused on a very interesting time period regarding the evolution of colorant and paint technology. For these reasons, the contribution of this research in the field of the material culture of this era is of great importance. The present study concentrates on eight (8) stone sculptures, Venetian (thirteenth to seventeenth century CE) and Ottoman (seventeenth to nineteenth century CE), hosted in the Historical Museum of Crete and at the conservation laboratory of the Heraklion Ephorate of Antiquities (both at Heraklion, Crete, Greece). Images of the selected stone carved works along with a brief contextual description for each one are shown in Table 1. 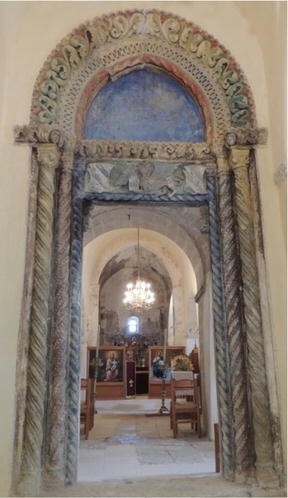 Outdoors campaigns, focussed on the analysis of paint on stone carved door frames, were carried out at selected rural churches in the greater Heraklion area (Crete, Greece) and indicative results are presented from the study of two different door frames dated to the 15th century. The first one is located at the Valsamonero Monastery near the Vorizia village [31–35] and the second at the church of St. George in the village of Kamariotis [31–34, 36, 37]. In Table 2 images of the studied door frames are shown while a brief description provided on the churches in which they are situated. A mobile Raman microspectrometer (JY Horiba HE 785) was employed in this series of campaigns. Excitation at 786 nm is provided by a cw (continuous wave) diode laser, fiber optically coupled to an optical head. The probe head is mounted on a XYZ micro-positioning stage and enables focusing of the laser beam by means of different objective lenses (10×, 20×, 50×) which provide a variable focus of the beam (magnification of the work area) down to a few microns on the sample surface. A white light illumination system and a high resolution colour camera (video microscope) are also part of the optical head and offer a very clear view of the area under investigation, necessary for positioning the beam on individual pigment particles or particle aggregates. The scattered radiation is collected through the objective lens, passes through an edge filter that cuts off Rayleigh scattering, and via a second optical fiber is fed into a compact spectrograph, equipped with a concave grating, which provides spectral coverage in the range of 100–3200 cm−1 at a spectral resolution of about 10–15 cm−1. The detector, a Synapse™ CCD (1024 × 256 pixels), is Peltier-cooled and features high sensitivity with low dark counts. During analysis the power delivered by the laser beam on the sample surface was adjusted in the range of 0.5–50 mW. Typical exposure time for each scan on the CCD was 20 s, and spectra reported correspond to an average of 5–20 consecutive scans on the same point. For transportation, the whole instrument is packaged in two carrying cases, a medium-sized one, housing the optical probe and the micro-positioning stage (dimensions: 46 × 33 × 17 cm3, weight 7.5 kg), and a larger one (dimensions: 61 × 48 × 30 cm3, weight 28 kg), containing the laser and its power supply unit, the sample illumination source, the spectrograph and the detector, all attached firmly onto a light-weight aluminium frame. A mobile LIBS spectrometer (LMNTII+), developed and constructed at IESL-FORTH, was used in these studies. The instrument uses a compact passively Q-switched Nd:YAG laser emitting pulses at 1064 nm (10 mJ/pulse, 10 ns). Pulses are focused by means of a plano-convex lens (f = +75 mm) on the surface of the object. The plasma emission is collected through the same lens and transmitted via an optical fiber that splits it into a dual spectrometer unit (Avaspec-2048-2-USB2, Avantes) that records emission spectra across a wavelength range extending from 200 to 660 nm, with resolution of about 0.2–0.3 nm. The laser along with necessary optics and a miniature CCD camera are integrated in a light-weight optical probe head. The camera offers a magnified view of the object surface during analysis and permits accurate aiming of the laser beam with the aid of a cross-hair indicator superimposed on the image. The probe head can be mounted on a XYZ translation stage. All LIBS spectra were collected with a time-delay of 1.3 μs with respect to the laser pulse and for an integration time of 1 ms. A nearly circular spot with a diameter of about 150–300 μm is probed by the laser beam. The instrument fits in a compact case (dimensions of 46 × 33 × 17 cm3) and weighs less than 9 kg. Instrument operation and spectra acquisition are fully controlled via a custom-made software. Both instruments are used in situ, with their corresponding optical probe heads positioned properly with respect to the surface of the object that is being investigated. Light and relatively small-to-medium size objects of flat geometry (maximum width: 90 cm, height: 30 cm), are typically placed on a table or bench top. The optical probe heads, already mounted on their corresponding XYZ translation stages, are attached on a table top rail. This arrangement permits parallel work with both systems over the surface of an object (Fig. 1a, b). Coarse positioning is achieved by sliding each probe head along the rail, while fine focusing, necessary for proper measurements, is achieved via the micrometer stages. In the case of larger or immovable objects, the instrument probe needs to be positioned close to the surface that is to be analysed, and this is achieved either by supporting the optical head on a standard tripod or by mounting it on a custom-made platform that enables lateral move of the head along a length of 1 m. This platform arrangement, supported on a pair of tripods (Figs. 1c and 2) permits measurements to be performed from a minimum height of 60 cm up to a maximum of 2 m. Finally, in case the object (or spot to be analysed) is over 2 m above floor level, only LIBS measurements are performed, by mounting the LIBS probe on a monopod. Normally, Raman analysis is carried out first, as it is totally non-invasive and can provide accurate molecular information, with high spatial resolution. Materials, inorganic or organic ones, are identified on the basis of their characteristic Raman spectral bands. Considering that paints can be significantly heterogeneous, careful aiming of the laser beam is critical for obtaining reliable results. However, given that Raman signals in some cases turn out to be quite weak, or masked by fluorescence emission, arising from pigments, binders or impurities, it is not uncommon that Raman analysis may not be fully conclusive concerning the identity of the pigment or pigments used in a painted object  particularly when analysis is performed in situ. Complementary analysis is performed by LIBS, which typically affords strong emission signals that enable one to draw information on the elemental composition of the paint, mainly the inorganic component of it, based on the characteristic atomic emission lines recorded in the spectra [25, 26]. A single pulse is adequate for obtaining a spectrum with high signal-to-noise ratio (S/N). Typically, two to three pulses are delivered at each point in order to ensure that reliable information is collected, as in some cases, it has been observed that the first pulse carries information coming mainly from surface dirt or dust. In any case, separate LIBS spectra are recorded for each individual pulse, and this is critical when depth profiling information is sought for. At this point it is worth noting that following, or intermittently with, LIBS analysis, the spot investigated can be probed again by Raman analysis. Such an approach can lead to improved Raman data if, for example, superficial dust and/or fluorescent impurities have been removed during laser ablation. Additionally this approach may provide extra information by permitting Raman analysis to probe underlying paint layers . This procedure was followed, in several cases throughout the studies reported herein, particularly when strong fluorescence was detected interfering with Raman analysis. Despite our efforts no signal improvement was observed, most likely due to the fact that fluorescence was coming from a component of the painting itself and not from any surface contamination. Once a LIBS spectrum is collected, the elemental content of the sample, in particular the identity of a pigment or pigments, can be often concluded in a straightforward way, on the basis of the elements detected and the color of the paint. For example, detection of mercury (Hg) confirms unambiguously the presence of the red pigment vermillion (HgS) or cinnabar in case the natural mineral has been used. The detection of lead (Pb) can be related to the presence of lead white (Pb(OH)2 2PbCO3) or red lead (Pb3O4) and in such a case the color of the paint is important for deciding about the pigment present. On the other hand, detection of copper (Cu) in a green painted area may not be enough to confirm the presence of malachite (CuCO3·Cu(OH)2) or verdigris (Cu(C2H3O2)2·2Cu(OH)2). Considering that paints can be mixtures of pigments in different proportions, containing also variable quantities of binders or fillers, a simple processing of the LIBS spectral information is performed that classifies elements on the basis of the strength of their corresponding emission lines as “strong”, “medium” and “weak”. Taking into account the relative strength of analytical spectral lines, observed in numerous LIBS studies on paint materials, it is proposed that this coarse distinction, strong-medium-weak, can be correlated with the relative concentrations of the various elements. This is a rather simplistic approach but can provide a quick assessment, albeit semi-quantitative, on the proportions of materials in the paint. It is noted that, while it is possible to extract quantitative information from LIBS measurements , doing so on the basis of single-shot spectra that have been collected from highly heterogeneous matrices, such as the paints investigated in this study, would not provide reliable information and therefore we have chosen to keep the coarse distinction as an indicator of the relative amounts of the various elements in the paint. Based on the considerations outlined above, processing of the Raman and LIBS spectra becomes rather straightforward and data from each area analysed can be evaluated and cross-compared very efficiently and in short times, often before a campaign is over. Typically, three scenarios are encountered: (a) results obtained by Raman and LIBS analysis are in full agreement, (b) complementary results are obtained and (c) no results have been obtained by one of the two techniques, for example, because of strong fluorescence emission during Raman analysis or due to weak signal in LIBS analysis. While in case (a) one can conclude that application of the two techniques leads to redundant information, in cases (b) and (c) the complementarity advantage of the techniques is attested, and analytical information is significantly enhanced. The combined information for each individual object is gathered in an interactive platform with links to raw data. Finally, a full analytical report is put together, outlining the aims of the study and providing information on objects or monument location along with relevant images with details, where appropriate, indicating the areas that have been analyzed. For each object, relevant analytical data are detailed along with the interpretation of the information derived from the compositional study. Important technical details, for example, related to laser power employed during analysis, spectral resolution or data averaging, are collected in an appendix. The whole report is discussed with the archaeologist(s), historian(s) or conservator(s) involved in the study, who contribute key information regarding the heritage context. The complete report is thus produced and delivered to the relevant authorities. Each campaign is preceded by a preparatory phase including a visit of the museum or monument, where analyses are to be conducted. This is important in order to determine, ahead of time, technical and experimental parameters relevant to performing properly the analysis. For instance, one needs to secure availability of a steady and reliable power supply or else foresee the use of a mobile power generator. Space and probe positioning issues need to be considered in order to assess the need for the use of support stages or scaffolding and to ensure trouble-free operation of instruments. Other, often critical, constraints include weather conditions, particularly for outdoors campaigns while opening hours of museums and archaeological sites may limit the time available for actual work. The first part of the study was performed in the premises of the Historical Museum of Crete and at the Conservation Laboratory of the Heraklion Ephorate of Antiquities with the aim to characterize paint materials on stone inscriptions and reliefs. The analytical results from Raman and LIBS analyses of the sculptures are summarized in Table 3. Ca, Ba, Na (s); Pb, Ti, Sr (m); Fe (w). The two Venetian inscriptions, AI86 and AI95 (Table 1) bear engraved writing on the stone surface, with figures containing remains of a black filling substance. There are no visible signs or traces of any other paint material. Raman analysis of the black substance revealed clearly the presence of a carbon black type of material, based on the characteristic graphite bands, as well as calcium carbonate, CaCO3, within the engraving of stone inscription AI86 (Fig. 3a). In addition the corresponding LIBS spectrum was characterized by strong molecular emission from the excited radical CN, which is a reliable indication for the presence of material containing sp2 carbon, in agreement with the findings from Raman analysis. On the other hand, in stone inscription AI95, Raman spectra collected on the black writing show only bands corresponding to calcium carbonate and no indication for the presence of carbon black. However, complementary analysis performed by LIBS provides clear evidence for the presence of manganese (Mn), suggesting the use of a Mn-based black pigment, most likely manganese black, MnO2 (Fig. 3b). Furthermore, less intense but clear emission lines from lead (Pb) and copper (Cu) were also observed in the LIBS spectrum suggesting a more complex mixture of materials. The presence of copper may be attributed to the use of a Cu-based blue pigment, possibly added intentionally in order to alter the hue and, thus, create a dark blue-grey effect, while lead may be related to the presence of lead white, Pb(OH)2·2PbCO3 . Magnesium (Mg) and strontium (Sr), detected also by LIBS, most likely relate to the carbonate matrix or other minerals. All five Ottoman inscriptions that were investigated are relief objects (Table 1), in contrast to the incised Venetian ones, and bear quite visible remains of paint on their surface. The red paint on stones AI244 and AI378 was clearly verified by Raman analysis to be red lead, Pb3O4 (Fig. 4a). LIBS analysis confirmed the presence of lead (Pb) (Fig. 4b) in the red painted area of the two inscriptions. This was also the case with the red background of the colored relief AI0176, suggesting the use of red lead, even though this could not be verified by the corresponding Raman spectra, which showed only a strong broadband fluorescence emission with no meaningful vibrational bands. Traces of yellow paint on AI244 were examined by micro-Raman spectroscopy and were proven to originate from chrome yellow, PbCrO4 (Fig. 5a). Confirming this finding, lead (Pb) and chromium (Cr) were detected by LIBS analysis in the same area of stone AI244 but also on the yellow paint of stone relief AI0176 (Fig. 5b), where Raman analysis was not conclusive because of a strong fluorescence emission background. In only one of the stones, AI0120, a colorful decorative relief of Minbar, its red painted surface, analyzed by LIBS, was found to contain mercury (Hg), and this was a clear evidence for the use of vermilion or cinnabar, HgS (Fig. 6). The concurrent detection of Pb and Cr at the same spot suggests that chrome yellow has been also used, probably mixed with the red paint. In the red parts of the star-like engraved ornaments, HgS was found to be dominant on the basis of LIBS analysis. The presence of HgS on this relief sculpture, which is a more expensive pigment, may be correlated to the significance of the Vezir Camii, where this stone originated from. The dark parts of the ornaments show strong molecular emission from CN, indicative of the use of carbon black. 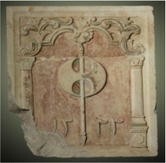 It is noted that this stone relief was on permanent exhibit at the museum at a height of approximately 2 m above floor level and for this reason no Raman analysis was possible. Calcium carbonate (on AI198, AI244, AI378), occasionally along with gypsum, CaSO4·2H2O, (on AI378), were detected by Raman analysis in all colorless areas on the stones, indicative of a white background layer. LIBS measurements showed the dominant presence of calcium (Ca) not only in the white painted areas but also in the colored ones suggesting the systematic use of a calcium based matrix component, possibly lime, in the paint. Likewise, barium (Ba) lines were evident in LIBS spectra collected from the Ottoman stone sculptures, and this was attributed either to the use of barium sulphate, BaSO4, as a matrix material in the paint or to the presence of it as a filler in the pigment. The presence of barium sulphate was verified by Raman analysis on the decorative stone relief AI076 in blue and light green colored areas. An interesting observation relates to the presence of lead (Pb), as verified by LIBS, in the white painted area of stone inscription AI378. The origin of Pb emission can be related to traces of red lead transferred to the white area from the neighbouring red paint, however possible use of lead white cannot be ruled out even though no evidence for the presence of lead white was obtained through Raman analysis in that area. Raman analysis confirmed the presence of two different blue pigments, ultramarine blue (Νa6-8(AlSiO4)6S2-4) at the blue painted areas of AI198 and AI0176 and Prussian blue (Fe4[Fe(CN)6]3) at the light green areas of AI244 and AI0176 (Fig. 7). Moreover, LIBS analysis contributed further with the detection of lead (Pb) and chromium (Cr) at the light green area, suggesting the presence of chrome yellow. The complementary information of the two techniques reveals that the light green paint has been most likely produced by mixing yellow and blue pigments. Raman spectra collected at the dark green areas of AI244 were dominated by an intense broadband fluorescence background and as such did not provide any information on the pigments present. On the other hand, LIBS analysis showed weak emission lines arising from copper (Cu) and based on this finding one could argue for the use of a Cu-based green pigment or perhaps a blue one in mixture with yellow. Based on the LIBS data (Table 3) featuring intense emissions from Ca, Pb, Cr, Ba the use of a significant amount of extenders possibly calcium carbonate and barium sulphate along with chrome yellow can be suggested. An alternative interpretation for the presence of chromium could be also based on the use of chromium green, Cr2O3 but the clear identification of lead chromate in the light green paint on the same object weakens this hypothesis. Finally, it is noted that, under optical magnification, green or blue paint in wall painting based on the use of copper pigments, for example, malachite or azurite, often have been observed to contain large pigment grains embedded in a matrix background at a medium to low surface density. These large crystallites are sufficient to provide a good coloration to the paint, but have been found , to contribute to low intensity emissions, when probed by LIBS, and this may explain weak Cu emission lines observed in the dark green paint area of AI244. Following examination under optical magnification, some areas, on three of the stones, were found to bear minute metal-looking remains of decorative coatings. Analysis by LIBS (Fig. 8a) shows clear emissions from silver, (Ag), gold (Au) and copper (Cu). This is strong evidence for the presence of a gold-silver-copper alloy, suggesting the use of a gold foil possibly as a decorative background of the paint. The medium intensity emission lines from aluminium (Al) and magnesium (Mg) and the weak but distinct ones from iron (Fe), titanium (Ti), silicon (Si) and strontium (Sr) may originate from matrix minerals such as calcium carbonate or calcium sulphate or even clay minerals and quartz, and have been detected in all paints, apart from Sr which has been identified only on the decorative reliefs AI076 and AI0120. The latter is believed to relate to the calcium carbonate matrix. Finally, a marble fragment, was investigated, that belongs to the collection of the church of St. Catherine of Sinai, a major monument in the city of Heraklion. This piece of sculpture, kept at the conservation laboratory of the Heraklion Antiquities Ephorate, has been difficult to assign in a certain historical context. However, scattered traces of paint have been found on the surface of the marble and thus it was decided to perform an investigation of the pigments. On the red paint, Raman analysis identified red lead (Fig. 4a, AG1), while LIBS analysis clearly indicated the use of a high-Pb-content paint. Weak Raman signal from red lead is also recorded at areas of a dark paint and also where a metallic shine was observed. This possibly suggests that red lead was used to paint most of the surface of this marble sculpture. In addition, both red and dark paint traces show in their LIBS spectra clear features of CN molecular emission that may derive from an organic binder or because of the possible use of carbon black, although it is noted that its presence was not confirmed by Raman analysis. Examination of dark green paint areas gave very weak, not conclusive, signals in Raman analysis but LIBS spectra showed strong emission from copper (Cu) (Fig. 8b), indicating the presence of a Cu-based green pigment, possibly malachite (CuCO3·Cu(OH)2) or verdigris (Cu(C2H3O2)2·2Cu(OH)2). At this point, it is added that it was not any fluorescence emission, which interfered with Raman scattering during analysis of the dark green paint, but rather, as stated above, the spectrum recorded was very weak. Considering that with the present excitation in the mobile Raman instrument (λexc = 786 nm) even pure green pigments, based on Cu, give very weak signals, this negative result may be an indirect evidence of the presence of a Cu-based pigment in the dark green paint. Finally, as expected, where traces of metallic shine were located, coming possibly from a gold foil decorative background, LIBS analysis showed the presence of silver (Ag), gold (Au) and copper (Cu). Despite the presence of only scattered traces of paint, the analysis performed has given a rather good picture of the palette of pigments, used for painting this marble sculpture, which are similar to those found in the investigated Ottoman sculptures. Thus, although it is difficult to date this piece of sculpture, because it is preserved in a fragmentary manner and has very simple decoration, the study of traces of pigments observed on its surface, suggests that the painted decoration may be dated to the Ottoman period. Summarizing, the study of painted Ottoman inscriptions and reliefs provided the first information about their palette, which was found to make use of several pigments such as red lead and more scarcely cinnabar or vermilion, chrome yellow, ultramarine, copper based blue or green pigments and a blend of Prussian blue and chrome yellow for light green hues. It was also shown that gold foil decoration was not uncommon. In the case of the limited set of Venetian inscriptions, it was found that two types of black substances were used in the engraved black figures, carbon black or manganese black, the latter possibly mixed with a copper pigment. Further analysis of painted stone carved works dating from the Ottoman and Venetian periods may reveal a more representative palette for each period and may contribute to the general historical knowledge in a number of ways, for example, assisting archaeologists to date artworks with confidence or conclude about the value of sculpture, particularly in cases luxurious decorative materials such as gold foils are found. Even more, it may assist research work concerning commercial activities and the import of goods or different materials and extend our knowledge about the technology of producing and using pigments during the late medieval and modern era in Crete. In the second part of this project, studies concentrated on the characterization of iconographic and decorative paints on stone door frames, in small churches situated at rural locations in the greater Heraklion area (Crete, Greece). The aim of the study was to identify the pigments used and attempt to establish similarities or differences in various parts of the paintings or assess the extent of conservation interventions. The results of the analysis are collectively presented in Table 4. This monument was studied only by the LIBS technique, as the church was situated at a location that was not easily accessible, so it was chosen to carry only the more compact and lighter LMNTII+ instrument. 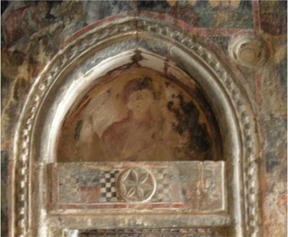 Analyses were performed on the figure of Virgin Mary painted at the tympanon over the door and right below it on the decoration of the architrave focusing mainly on the coat of arms. The LIBS spectra obtained on the mantle of Virgin Mary, revealed the presence of a red paint rich in iron (Fe) that had also a low content of manganese (Mn) (Fig. 9a) suggesting most likely the use of umber . The red paint at the decoration of the architrave was found to contain iron but no manganese, suggesting in this case the use of red iron oxide pigment (anhydrous ferric oxide, Fe2O3). The detection of two different pigments used for the red paint may be in support of an assumption made by archaeologists that these two parts of the frame were painted in different time periods with the figure of Virgin Mary painted in the beginning of the fifteenth century CE and the rest of the door frame decorated some years later, when the outer narthex was added (see Table 2). The LIBS spectra acquired from the black areas were characterized by strong CN emission, implying the use of carbon black or a similar carbon containing pigment (Fig. 9b). Calcium (Ca) was the dominant element in all the white paint areas studied, suggesting that either calcium carbonate or gypsum was used as a white pigment. Other elements such as aluminium (Al), magnesium (Mg) as well as titanium (Ti) at very low concentration were detected in the LIBS measurements and may originate from matrix minerals, such as calcite, gypsum or kaolinite. Furthermore, Ti may exist as impurity in the detected earth pigments . Both instruments were employed in this campaign. Micro-Raman spectra revealed the presence of ultramarine at the light blue areas of the different color domains while in areas of dark blue paint, carbon black was the pigment identified by Raman analysis. Red iron oxide was determined as the red pigment used in the red part of the door frame (Fig. 10a). These findings were confirmed by LIBS analysis with the dominant emission from iron (Fe) observed in spectra obtained at the red paint and the molecular emission from CN in spectra collected from the dark blue areas. Furthermore, LIBS analysis showed the clear presence of Fe at the light blue areas, which could be interpreted as deriving from the presence of Prussian blue in mixture with ultramarine blue. Raman spectra recorded on brown painted areas were rather weak in intensity and failed to provide any reliable information concerning pigments. However, strong emissions from both manganese (Mn) and iron (Fe) were detected by LIBS in the brown paint (Fig. 10b), and this could be interpreted as evidence of a mixture of manganese black or brown pigment with red iron oxide. Likewise the detection of chromium (Cr) and lead (Pb) in the yellow painted parts of the door frame was critical in obtaining strong evidence for the use of chromium yellow (PbCrO4) possibly in mixture with yellow ochre (hydrous ferric oxide, Fe2O3·nH2O) as it can be suggested based on the detection of Fe at the same spot. Detection of significant amounts of barium (Ba) by LIBS in the red, brown, light blue and yellow paint domains suggests the presence of barium sulphate, and this was further confirmed on the basis of Raman spectra collected in the yellow painted areas. The dominant presence of zinc (Zn) may be translated as an evidence for the presence of zinc oxide (ZnO) possibly used as an extender in the paint. However the simultaneous presence of barium and zinc might indicate the presence of lithopone, ZnS·BaSO4. The presence of titanium (Ti), in very low concentration, in the blue and brown areas, but in higher concentration in the red and yellow paint, could be ascribed to impurities present in earth pigments and matrix minerals  or to titanium white (TiO2) probably coming from later painting interventions known to have taken place at the church in the beginning of the twentieth century CE. Unfortunately, no additional documentation concerning these intervention was found. It is noted, that the presence of TiO2 was not confirmed by Raman analysis. Aluminium (Al) and magnesium (Mg) were also detected all across the door frame, most likely originating from matrix minerals, while the presence of strontium (Sr) relates to the presence of calcium carbonate. An interesting observation was made during LIBS measurements performed at different spots over the brown painted areas. At the 1st laser pulse analysis, chromium (Cr) was clearly detected but was not further observed during analysis at the same spot with the 2nd and the following pulses. This implies that the existence of Cr is only superficial. It is noted that no lead (Pb) was detected, which in correlation with Cr could suggest the superficial existence of chromium yellow used in the yellow paint. Noticing that at the brown area investigated, it is seen that a small part of the paint is missing, in a way that indicates a local intervention performed at a later time, it could be speculated that the localized and superficial presence of Cr could be correlated with the application of an adhesive during a modern restoration (e.g. a lime free casein adhesive in which commonly an oxide or salt of chromium is added to improve water resistance) . During the series of analytical campaigns described in this article, it became evident that the proposed methodology, based on the combined use of mobile Raman and LIBS instruments, for the in situ investigation of heritage objects and monuments, provides several analytical and operational advantages and holds potential for becoming a useful tool in support of field survey and conservation campaigns. Concerning instrumentation, both spectrometers are easy to transport on location, set up and operate. They are user-friendly and provide within seconds or minutes valuable results, enabling assessment of analytical findings in real time and aiding informed decision making. No sampling is necessary, hence analysis can be performed directly on the surface of the object or monument under investigation. The Raman and LIBS techniques afford molecular and elemental analysis data respectively but their joint exploitation in the field was found to provide enhanced information concerning the composition of complex materials, such as the paints investigated in this study. The overall methodological approach that was adopted for performing analysis at the areas of interest on the object/monument, for handling and managing experimental data and for presenting the analytical information, facilitates interdisciplinary cooperation and thus increases the efficiency of field investigations. However, it is important to emphasize that despite the capacity of the present spectrometers to afford quality spectral data, proper handling, interpretation and presentation of the data and associated information (e.g. images), the in-situ investigation of artworks remains a challenging task, and even more so when two or more analytical techniques are employed. Therefore, key improvements in the overall methodological approach (data acquisition, interpretation, reporting-publishing) need to be considered and to this end introducing standardized procedures and protocols is very important. Such standardization is expected to facilitate analytical studies of heritage objects ensuring optimum use of information and maintenance of it for future use. Clearly, additional tests and actual field campaigns are expected to further refine the current methodological approach, promote standardization and contribute to technical improvements. It should be clarified that the term “sculpture” when used in the present article does not describe “statues” or generally “sculptures in the round”, as their production was rather scarce in Crete during the Venetian era and there have been no sculptures of this kind during the Ottoman era. ZEP performed LIBS measurements in the field, data analyses, interpretation of the results emerged from both techniques and wrote the present article. AP performed Raman measurements in the field and data analyses. PS performed LIBS measurements in the field and data analyses. 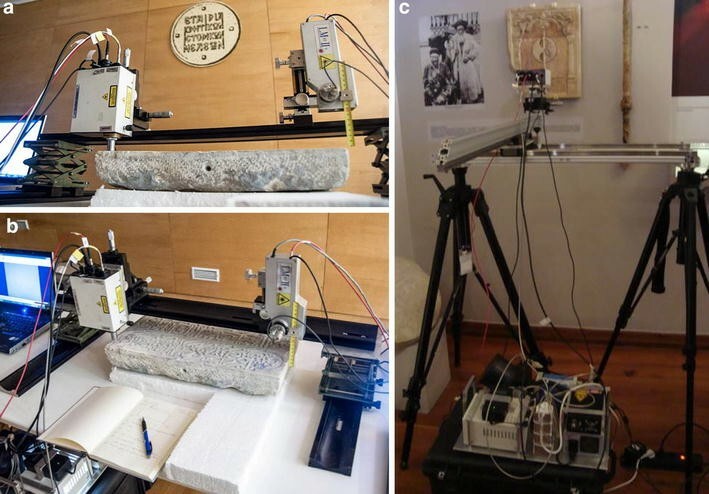 PS developed the mobile LMNTII + , and in cooperation with ZEP and AP worked on the adaptation/improvement of both instruments (LIBS and Raman) for the in situ analysis of heritage objects. MV selected the objects and the monuments that were studied and contributed significantly to the historical aspects of the work, both during the project realization as well as in the article preparation phase. KM provided support in preparing and running the campaigns, and was in charge for handling objects during analysis, in cooperation with the museum or the Ephorate conservators. DA coordinated and supervised the campaigns/experimental field work, the data interpretation as well as the drafting of this manuscript. All authors read and approved the final manuscript. The authors would like to gratefully acknowledge the Historical Museum of Crete, particularly Dr. E. Grammatikaki (Director), Prof. A. Kalokerinos (Chair of the Governing Board) and Mr. A. Kaloutsakis (Curator) for their support during the analyses performed at the Museum, as well as the Heraklion Ephorate of Antiquities and especially the Director Dr. V. Sythiakaki and her staff for providing access to the various monuments and guidance for the analyses. Moreover, authors would like to thank Dr. A. Anastasopoulos, Assistant Professor of Ottoman History at the Department of History and Archaeology of the University of Crete, for translating the Ottoman inscriptions and Dr. O. Gratziou, Professor of Byzantine Archaeology and Art History, for her supervision throughout this research, concerning the historical context of the work. The work presented in this paper has been supported by a) the POLITEIA research project, Action KRIPIS, project No MIS-448300, funded by the General Secretariat for Research and Technology, Greece and the European Regional Development Fund (Sectoral Operational Programme: Competitiveness and Entrepreneurship, NSRF 2007-2013)/European Commission; and b) the IPERION CH project, funded by the European Commission, H2020-INFRAIA-2014-2015, under Grant No. 654028. Vassilaki M. Saint Phanourios: cult and iconography. ΔXAE. 1980-81. p. 223–38. doi: 10.12681/dchae.909.